I am the course administrator and sole course instruction for the junior/senior “MMG 431:Microbial Genetics” course at MSU. This is a large lecture course consisting of ~150 students. My goal is for the students to learn at a molecular level the fundamental principles underlying microbial genetics, and develop skills in formulating genetics-based scientific approaches to understand biological systems. The Fall of 2016 was my eighth year teaching the course, and the fourth year that I was the sole instructor. I am passionate about the material, and I love to see the students blossom into new microbial geneticists as the semester progresses! Fig. 1. Actual lecture from 2016 with a pre-class riddle. Can you guess it? Due to an inattentive classroom and propensity to add too much information and details, last year I dropped using PowerPoint for my lectures and instead switched to a “chalk-talk” style of teaching. 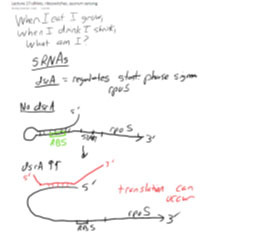 I do this using OneNote and a touch screen laptop projected on two screens (example in Fig. 1) only occasionally using slides for very complicated structures. I also have multiple in-class active learning questions that utilize iClickers, and weekly online homework. I reported an analysis of the results from my first year of teaching in this format last year in this blog: 2/2016-Point Break: My experiment with dropping PowerPoint in a large lecture course. 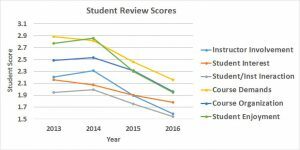 To summarize this blog, I saw an improvement in all outcomes including student review scores, positive versus negative student comments, and increased student grades relative to the previous two years of using PowerPoint. However, with a n=1 it was possible that the results were an anomaly. In this blog, I repeat the analysis to ask if dropping PowerPoint really did improve course outcomes. The second time I used the chalk-talk approach to teach my course was unsurprisingly much easier. I had already distilled previous PowerPoints into the pertinent notes, and I spent less time preparing for class and was more comfortable with each lecture. When teaching with this style it can be easy to forget or leave off important points over time, and one must be cautious to reexamine each lecture. I also upgraded my laptop to a Microsoft Surface Book (love it! ), and I could write notes more naturally with the touchscreen pen. I also implemented pre-class riddles or puzzles to get their brain juices flowing (see Fig. 1). This was a lot of fun and helped to make the class environment more relaxed. Finally, I proceeded slower through the material not worrying too much about staying on track with the syllabus. This led to a couple of topics that didn’t get covered, but overall improved understanding. In fact, this is the first year that I have ever had the comment “I wish we could have gone faster”. Add that to the list of unbelievable things that happened in the Fall of 2016. Student evaluations-What did they think? All students in MSU courses are required to fill out SIRS evaluation forms. These consist of 21 questions that are scored from 1 to 5 with 1 being the top score and 5 being the worst score. The scores are then aggregated into the six general categories shown in Fig. 2. 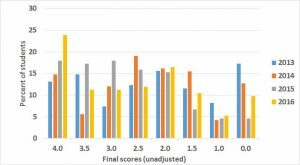 I am happy to report that all five categories exhibited lower scores relative to the previous year and these were my best SIRS scores in 8 years of teaching. One could argue that this is due to increased experience with the course; however, by the seventh and eighth year of teaching this course I think that experience is not much of a factor, and I’ll note that scores in 2013 and 2014 before I made the switch were stable. Fig. 3. Net difference in aggregate SIRS scores for the six categories. To determine which category benefits the most from dropping PowerPoint, I subtracted the lowest scores (all in 2016) from the maximum scores (either in 2013 or 2014) in each category (Fig. 3). 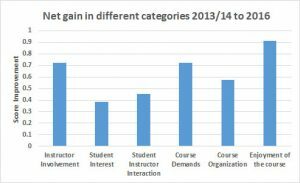 “Enjoyment of the Course” showed the greatest gain in student evaluation scores followed by “Instructor Involvement” and “Course Demands”. We all want our students to have fun and share in the passion that we have for the material, so I am quite pleased that course enjoyment has improved so much! Fig. 4. Grouping of specific student’s SIRS comments into negative, positive, or neutral. The final data that can be gleaned from SIRS reports, which is perhaps the most important, is taken from the specific comments section. I analyzed the specific comments provided by the students and grouped them into positive, negative, or neutral categories. The results are surprisingly consistent with 2015 showing that the majority of responses were positive, which is a dramatic shift from 2013 and 2014 when I used PowerPoint (Fig. 4). The negative comments fell into three general categories: 1) it is difficult to take notes/lectures should be posted, 2) the homework is not helpful/hard, and 3) more guidance should be given for test preparation. I was inspired to read in some of the positive comments about students who had no interest in microbial genetics before the course but were now motivated to learn more about the field and possibly pursue studies in this area! The rubber meets the road-How were the grades? Fig. 5. Score breakdown from 2013-2016. It is well and good that the students enjoy the class, but they are there to learn. So perhaps the most important indicator of success is the breakdown of the final grades, which is shown in Fig. 5. The most interesting observation was that the 4.0 group had the largest numbers of students consisting of almost 25% of the course. Compared to 2015, there were fewer mid-range students in the 3.5 to 3.0 categories, and more students in the 1.5 to 0.0 group. This is surprising, and a bit disappointing, considering that I covered less material in 2016 than in 2015. The analysis of the second year of chalk-talk teaching suggests that the improved outcomes versus PowerPoint lectures were real, and I will continue to teach in this manner. I did give two recorded lectures in the Fall of 2016 due to travel, and many students commented that it was helpful to be able to pause, rewind, and review parts of the lecture to assimilate the information. For Fall 2017, I plan to post my lecture notes and record my lectures to help those students who have trouble taking notes during class, and perhaps try a flipped classroom approach to incorporate more active learning. It can be a bit scary to drop PowerPoint, but it has been the best decision I have made as a teacher at MSU.